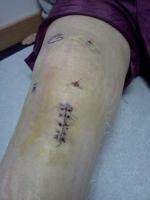 I fell hard on concrete on my right Knee about 8 weeks ago. It feels a generally painful but its a dull type pain and not sharp. I can feel a crescent shaped area where it feels as if a piece of the bone was chipped but there is no pain from touch and I cannot feel anything loose. I am hoping its just a bone bruise or could it be a "dent" as there is nothing lose and no sharp pain to touch. The pain is not very acute and its just a dull/warm ache type pain that runs from my Knee and down/up leg. I suppose I am looking for reassurance that I can allow it to recover without seeing a Doctor as I am travelling away from Home & its difficult for me to see Doctor...How long doe a Bruise take to heal and does it sound likely it is a Bruise that I can allow to heal with rest or..?